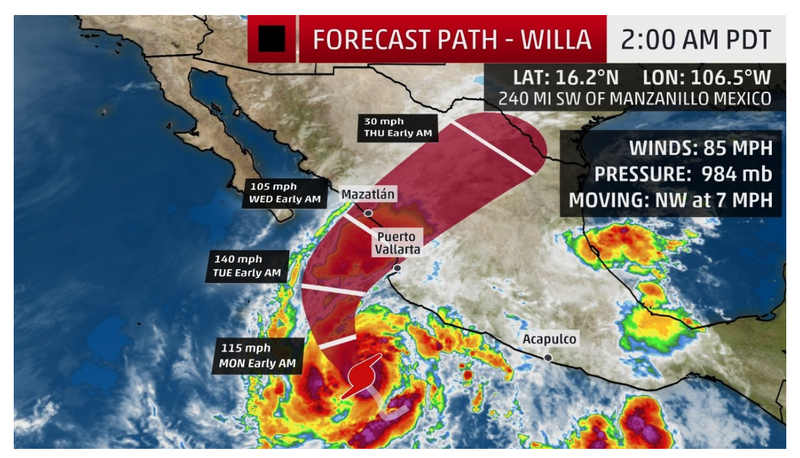 Willa has rapidly intensified into a hurricane in the eastern Pacific and will threaten Mexico by midweek with damaging winds, flooding rain and storm surge. Tropical Storm Vicente also poses a heavy rain threat to Mexico this week. Vicente and Willa have helped clinch a record-breaking hurricane season in the eastern Pacific. Hurricane Willa has intensified rapidly off the Mexican coast. Willa is forecast to make landfall in Mexico by Wednesday. Moisture from Willa could eventually enhance rainfall in Texas and possibly along the Gulf Coast. Tropical Storm Vicente is also forecast to make landfall in Mexico later this week. 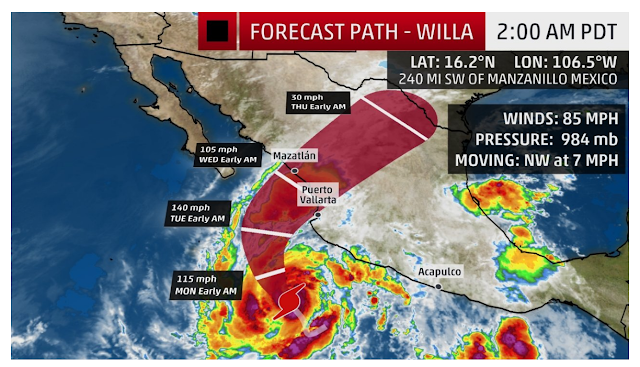 Willa is tracking northwestward but is expected to slowly recurve toward the northeast by Tuesday and should make landfall in northern Mexico on Wednesday. Landfall of the circulation center is expected anywhere from near or north of Mazatlán to near Puerto Vallarta. Low wind shear (change in wind direction and/or speed with height) and very warm water temperatures will allow Willa to continue intensifying early this week into a major hurricane (Category 3 or stronger). Increasing wind shear will lead to weakening as Willa approaches landfall, but it should still be a formidable hurricane. Damaging winds, storm surge, and flooding rainfall are all expected impacts near and just inland from where Willa moves ashore. The remnant upper-level energy and moisture from Willa could eventually enhance rainfall in Texas and perhaps the northern Gulf Coast Wednesday into Thursday. Tropical Storm Vicente is a very small tropical cyclone but will continue to pose a threat of heavy rain to southern Mexico early this week. 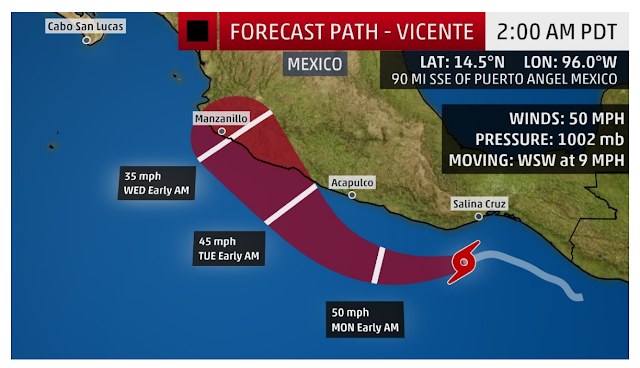 Vicente is forecast to make landfall in southwest Mexico as a tropical storm by Tuesday or Wednesday.